National Parks encompass some of the world’s most remarkable landscapes, and each one has a unique character, terrain, and history. Whether you’re planning a trip to just one park, or stringing a few together on your road trip, bringing specific gear with you can enhance the experience. We’ve teamed up with She Explores to bring you our favorite essentials for National Park exploration. From gear to a National parks passport, we cover all the goods you’ll need when you set out on your next adventure. Check out the details below. 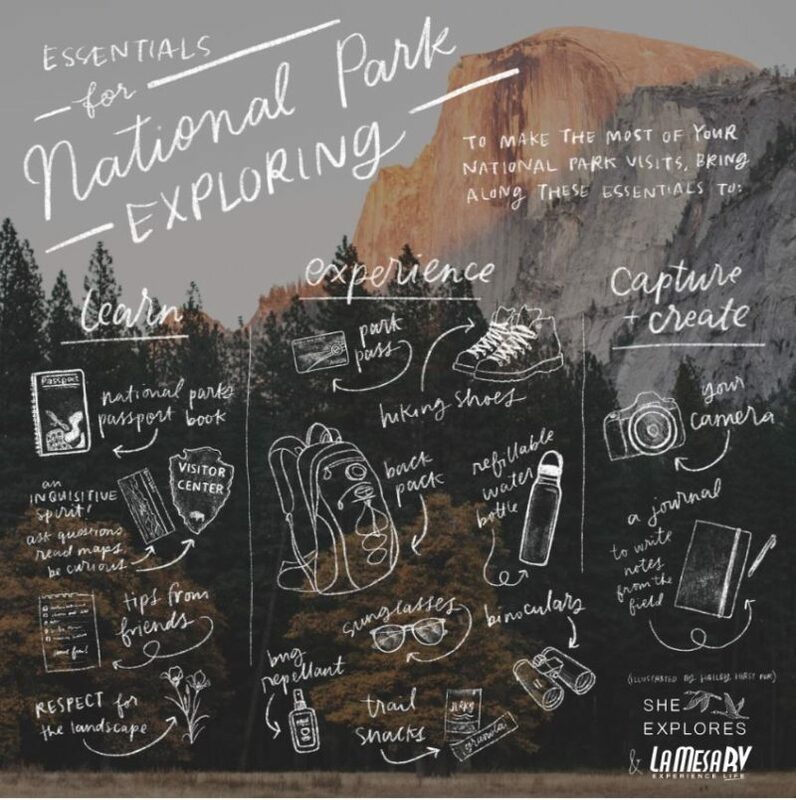 Not only does this compact book help you find national park sites and adventure areas while you’re traveling, the passport program takes you inside each visitor center to collect your stamp from the park you’re traveling through. There is much to learn about each national park. From the history of the land to its people, there is so much knowledge to be consumed. What is special about the geography? The plants? The wildlife? Get maps from the visitor center, talk to the park ranger on duty, ask for tips, read the displays, watch the videos, and explore the park with all this in mind. Set yourself up for discovery by keeping a curious mind. You may not have been here before, but you might know someone who has. 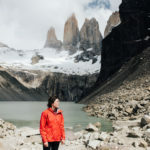 Find out your fellow travelers favorite hiking trails, where they camped, what they loved, and what they wished they’d spent more time doing. You might already be familiar with Leave No Trace principles or perhaps you’re just learning. Either way, exploring with respect for the landscape not only benefits plants and wildlife, but it also helps preserve these often unique and fragile environments for future visitors and generations. This is your ticket in the door. Whether you’re paying to enter for one day, or investing in an annual pass, the price of your entry helps the parks maintain amenities and funds programs like artist residencies and workshops. It’s worth it. Because do you really experience the park if you just drive through it? Tie up your laces and hit the trail to see the park’s beauty up close. Be sure to pack out what you bring in and stay on the trail! You’ll find water stations or drinking fountains to fill your bottle inside the park, so bring a bottle to stay hydrated and skip the plastic. Carrying water is essential in the harsh environments of the desert parks like Death Valley, Canyonlands, White Sands, and Joshua Tree. To carry the ten essentials, bring a backpack with extra room to pick up litter you find while you’re out there. Remember to pack your first aid kit and light layers! Stay fueled while you explore with energy-dense and easily-digestible trail snacks. We love jerky and trail mix, and bars are good too. Pack enough to share and you might make a friend out there. Bugs can ruin an outdoor adventure in no time, so bringing along insect repellent allows you to experience the park without the distraction and discomfort of itchy bug bites or stings. Protect your eyes from the sun while you take in all that natural beauty, but don’t forget to protect your skin too. Be sure to wear your sunscreen rain or shine, and it doesn’t hurt to consider bringing a hat along for some added sun protection. For a better view of birds, distant rock faces, hieroglyphs, and more, bring binoculars so you can see up close without leaving the trail or overlook. Do you take field notes? Write poetry? Does a walk outside open your mind to ideas? Bring a notebook or journal to record those thoughts and reflections. We’ve teamed up with She Explores to giveaway two National parks passes and She Explores debut book. To learn how to enter, check out our recent post. Are you going to celebrate National Parks Week this April? Let us know which park you’ll be exploring in the comment section below. 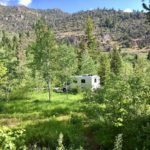 Hey Buddy!, I found this information for you: "She Explores Survival Guide to National Parks with La Mesa RV". Here is the website link: https://experiencelife.lamesarv.com/2019/04/she-explores-survival-guide-to-national-parks-with-la-mesa-rv/. Thank you.